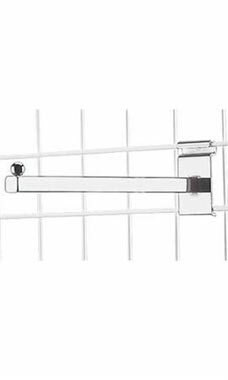 The Chrome 12" Straight Faceout for Wire Grid will let you maximize your wire grid panels and free standing displays. Faceouts allow you to face your merchandise forward in a linear clean way quickly and efficiently. The flexibility of the fixture allows for displaying all types of clothing, accessories and housewares. The faceout features a 1” square tube with a round ball tip to keep the merchandise from sliding off the end.